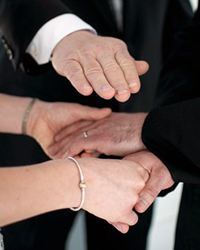 Choosing the right Wedding Officiant is very important! You want everything to be perfect for your upcoming wedding... and that includes the officiant, because the right officiant can ensure that your wedding will be a very special day. 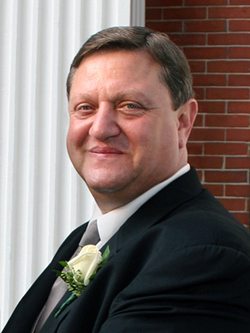 Hello, I'm Ernie Chiaradonna and I believe I'm just the kind of wedding officiant you're looking for because I absolutely love what I do and can think of no greater satisfaction than helping sweethearts and lovers become happily married couples. I have been referred to as both non-denominational and multi-denominational and I guess both are true. Although an ordained minister since 1978, I am not governed by any one religion or belief system, rather, I embrace the belief systems of all people. Want a religious ceremony? No problem. Want a completely non-religious ceremony? Again, no problem. Want a little of both? You guessed it—no problem! And unlike some priests and ministers who can only perform ceremonies allowed by the dogma and doctrine of their church, or a Justice of the Peace who may not be able to offer a spiritual aspect to your ceremony, as an inter-faith minister and certified wedding officiant I enjoy the freedom to perform religious or secular weddings and joining ceremonies tailored to your individual situation. I can provide you with the entire ceremony, so you'll have one less thing to stress about, or help you add your own personalizing touches and even write your own vows, if that is your desire. For those who want to be even more involved, I will work with you to create a beautifully personalized and custom-written ceremony that you and your guests will remember for years to come. It's entirely up to you. The point is, I'm experienced and flexible and I'll work with you to insure that your wedding ceremony is exactly what you want it to be! with honors in Public Speaking and Human Relations. On October 25, 2012 I was honored to achieve the title of International Certified Christian Chaplain. My credentials now far exceed all requirements needed to perform Sacerdotal Ceremonies throughout the United States and around the world. If you are now thinking about having me perform your Wedding Ceremony, thank you; I'm grateful to have the opportunity to be considered. The next step is for you to drop me an email telling me about your upcoming ceremony; especially the date and time so I can check my calendar. At that time you can also ask any questions you may have. I promise to answer you fully and honestly. Once we've made that initial contact and have confirmed that your date is available, we can schedule our first meeting. It's really that simple. During our meeting, we'll get to know each other and discuss your thoughts, ideas, and visions for your special day. We'll also talk about how, together, we are going to create a wedding ceremony that you and your guests will remember fondly for many years to come. If, during our meeting, you are satisfied that I'm the person you want to perform your ceremony, it is highly recommended that you reserve your special date at that time as my calendar fills up quickly. For those whose schedule or location make it difficult to meet in person, we can handle the entire process via email, postal mail, and phone. I have successfully worked with couples from as far away as California. Let's discuss how I can help you craft your ideal wedding ceremony. Feel free to email me at ReverendErnie@gmail.com and I'll be happy to discuss your needs. I'm honored to have received a perfect five-star rating from so many wonderful couples! © 2008- E. A. Chiaradonna. All rights reserved.